The SO What Brothers have been entertaining Colorado and neighboring states since 2007. 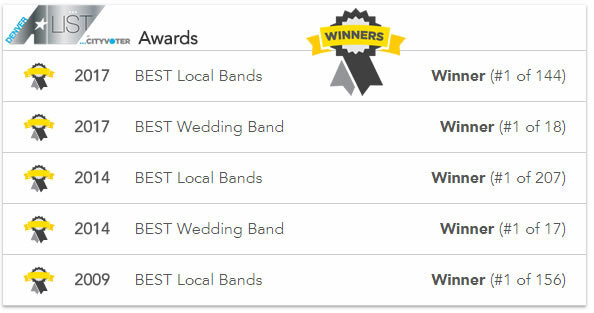 Westword, CBS Denver and ABC A-List voters have recognized us as one of Colorado's best cover bands. They provide fun, lively entertainment for weddings, corporate events, private events and nightlife locations. Their song list is eclectic, fun, and provides something for everyone! The SO What Brothers is one of the most popular, in-demand bands in Colorado. To request pricing or more information for your event, complete the form below. Dynamic Production, Inc manages the SO What Brothers and additional Colorado talent from every genre. If the SO What Brothers are unavailable for your event we will send you a list of additional talent based on your entertainment goals and information provided.